Dubai based Nicolas M. Kyvernitis Enterprises (NMK), leading distributor of professional AV equipment and musical instruments, and exclusive distributor of Shure products in the Middle East, has recently provided eclipse Staging Services, a leading supplier of event technology services and a member of the eclipse Group of companies, with Shure Premier Wireless Technology, 24 channels UHF-R system. UHF-R Wireless systems, a breakthrough in wireless technology, master the complexities of large scale wireless installations with greater efficiency, enhanced flexibility and complete control, while delivering unmatched Shure sound. Based in Dubai and active throughout the entire GCC, the eclipse Staging Services has built a renowned reputation as one of the top three event technology rental suppliers in the region. Its audio department has seen impressive growth and investment across the board over the past 36 months with continued commitment to service the needs of the market excellently both in equipment and expertise to the highest possible levels. Having built toward an inventory of over 60 channels of UHF-R and ULXD is just one example of the commitment. Through the years eclipse has seen the rapid development of their audio department. 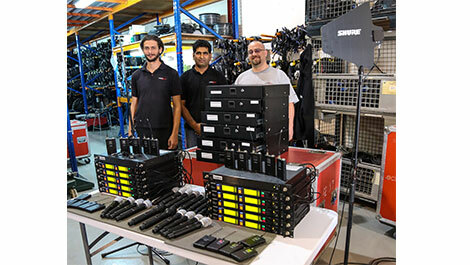 With investing into 60 Shure wired mics, 32 channels of UHF-R, 20 channels of ULXD and all the peripherals associated with RF mics the company is capable to satisfy various requirements of their clients. “Personally, I have dealt with distributors for well over a decade in Dubai and in that time, have become extremely good friends with the NMK Team. Yes, we are doing business but it’s always done in a friendly manner and with the knowledge that when things need to happen quickly, they invariably do. We are in constant communication with the various sales representatives at NMK on both short term and long term purchasing options. The best thing about NMK is that you can rely on prompt replies to all enquiries and the level of service is without any doubt second to none within the region. It’s the after sales care that is most impressive that once you have bought a product they will ensure training and support is offered at all times required.” Added Mr. John Parkhouse, Head of Audio at eclipse Staging Services.